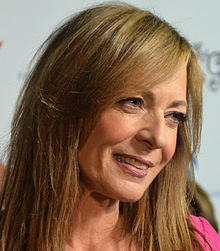 آلیسون جانی (اینگیلیسجه: Allison Janney) آمریکالی اوْیونچو ۱۹ نوْوامبر ۱۹۵۹ ‏ میلادی تاریخینده بوستون شهرینده دۆنیایا گؤز آچیب. آلیسون جانی کنیون کالجی دا درس اوْخویوب. ۱۹۸۴–گۆنوموز ایللر آراسیندا سینما ساحه‌سینده چالیشیب. 1992 Law & Order Nora Episode: "Star Struck"
1994 Law & Order Ann Madsen Episode: "Old Friends"
1995 The Wright Verdicts Alice Klein Episode: "Sins of the Father"
1995 New York Undercover Vivian Episode: "Digital Underground"
1996 Aliens in the Family Principal Sherman Episode: "A Very Brody Tweeznax"
1996 Cosby Podiatric Nurse Episode: "Happily Ever Hilton"
1999 LateLine Helen Marschant Episode: "The Minister of Television"
2003 King of the Hill Laura Episode: "Full Metal Dust Jacket"
2005 Weeds Ms. Greenstein Episode: "Lude Awakening"
2007 Two and a Half Men Beverly Episode: "My Damn Stalker"
2007 Studio 60 on the Sunset Strip Herself Episode: "The Disaster Show"
2010 Lost "Mother" Episode: "Across the Sea"
2011 Glenn Martin, DDS Marcia Episode: "GlennHog Day"
2012 The Big C Rita Strauss Episode: "Life Rights"
2012 Robot Chicken Grammi Gummi / Woman (voice) Episode: "In Bed Surrounded by Loved Ones"
2013 Veep Janet Ryland Episode: "First Response"
2016 The Simpsons Julia (voice) Episode: "Friends and Family"
2016 Comedy Bang! Bang! Herself Episode: "Allison Janney Wears a Chambray Western Shirt and Suede Fringe Boots"
2017 American Dad! Jessie (voice) Episode: "Family Plan"
2018 DuckTales Goldie O'Gilt (voice) Episode: "The Golden Lagoon of White Agony Plains!" ↑ Perkins, Dennis (June 11, 2017). F Is For Family knows that all family debts come due sometime. The A.V. Club. یوْخلانیلیبJune 25, 2017. ↑ Nicole Evatt (10 October 2016). Allison Janney clowns around in Rachael Yamagata’s new video. The Salt Lake Tribune. یوْخلانیلیب2016-10-12. اینگیلیسجه ویکی‌پدیاسی‌نین ایشلدنلری طرفیندن یارانمیش«Allison Janney»، مقاله‌سیندن گؤتورولوبدور. ( ۲۱ دسامبر ۲۰۱۷ تاریخینده یوْخلانیلیبدیر). قارداش پروژه‌لرده آلیسون جانی گؤره داها آرتیق بیلگی‌لر تاپابیلرسینیز. بۇ صفحه‌‌ سوْن دفعه ‏۱۳ مارس ۲۰۱۹، ‏۱۱:۵۳ تاریخینده دَییشدیریلمیشدیر.